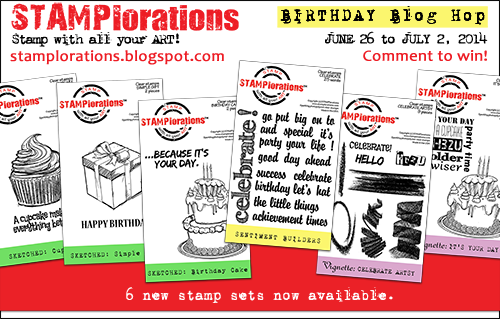 STAMPlorations is celebrating its first birthday with a blog hop and new release! I am so thrilled to have been invited to join the party as a Guest Designer! Here's my card. I realized at the last minute that somehow I don't have any Stamplorations sentiments (I'l be fixing that situation ASAP)! So I used my favourite flower from Eclectic Florals two ways. I stamped each flower on a circle die cut and then flipped the stamp over, stamped off once and 'coloured' the flower in with that impression. I used the stem in the set to create a frame. And finally, for some more interest, I stacked them all with the flower colour, but each one at different heights. You can win Eclectic Florals set by leaving a comment here. And by visiting all the stops on the hop and leaving a comment on each one, there's more chances to win stamps. There's over $120 worth of stamps to be won! The new release will be available to buy on the shop during the hop. If you buy all 6 sets it's only $30 (17% off) + free shipping in the US (flat rate to other countries). Go check it out at http://stamplorations.com/newrelease/ ! 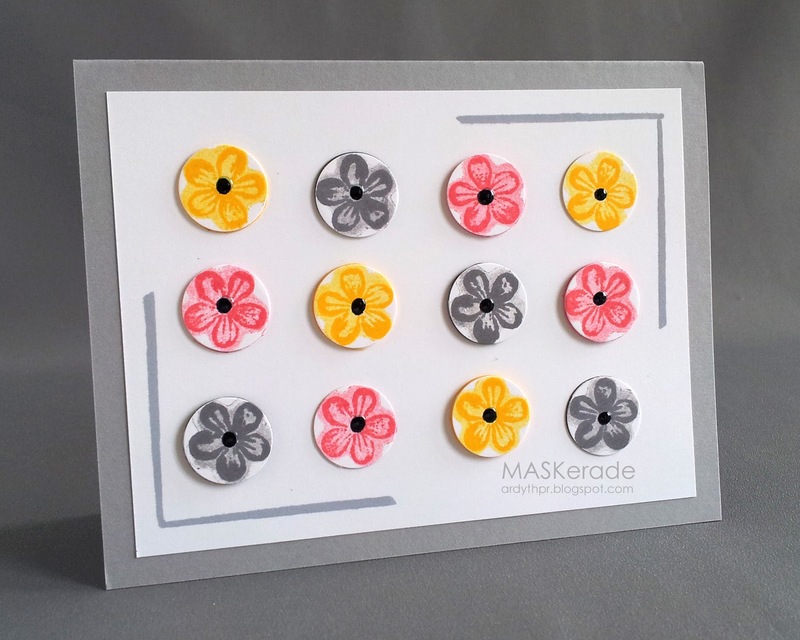 PS - this is another card I made solely with the 'back' of that flower stamp, inspired by the scrap paper where I was stamping off while making my first card - see? inspiration really is everywhere! Nice colors you chose for your cards. Congrats on the guest designer gig - so well deserved! The varied layers look awesome! Love the little flower stamps - endless possibilities! Sooooo clever to use the stem stamp to create the corner anchors! Lovely Blooms on your card and love the style to create the corners!! Your 2nd card is pretty too!!! Love the colours and layout. Thanks for the hop. Ardyth congrats on your guest design, love the button flowers and how you stamped with the backs of the flowers too! Absolutely fab cards Ardyth, what fun to join in with Stamplorations for their special occasion! Fabulous card, I love the colour combination. Oh love the colors! Simple, yet so, so elegant!! Love that color combination. A fun card and a great explanation of how it was created. Thank you. Ardyth this is so pretty! Thanks for sharing. Cool colours and as always your cards are CAS and beautiful! Hey there GF - So fun to have you GDing with our hop! Wonderful cards!! Love both cards. Great job. Love this colour combo and the way you used the back of the stamp - so clever! These are so beautiful! Love your colors! And...your Ardyth-esque style works perfectly with these stamps! So clever to use them front and back, and, in turn, be inspired with your 'stamping off' to create yet another gem! Delights, both! i love your bonus card! How clever you are, using the front and backs to make two beautiful cards. For once I'm ahead of you, I have order all their different word stamps. Clean, simple and beautiful. Love them both. Both lovely cards but like the two step stamping on the first one. Lovely cards! Great idea, using the back of the flower stamp! I just love seeing the CAS greatness! Congratulations on your GD spot, Ardyth! Love your CAS cards! So pretty! Okay..... now you've inspired me greatly to look at all my stamps and see which ones I can stamp using the backside. Thanks for that great tip. Ardyth, your color combination is stellar! And your card is sweet! Fabulous color combo! Love the simple designs - they look amazing! All I could think when I saw your card was - GORGEOUS!!! What an inspiration!! Such a great card.. will have to look at all the new stamps in this release..
so pretty! Love both cards and the color combo you used too! What a beautiful card!!! but I love both cards you made. Congratulation. Very cleverly designed, Ardyth! The colors are very mod, too. Love the second card using just the back of the stamp. Such a pretty card and cute colours. As a new(ish) and fairly unaccomplished stamper, I like hearing how you all do these wonderful cards. Great cards with a very clever colour scheme. I really like these. Gorgeous, gorgeous colours! I love both cards! Beautiful flowers, nice and simple..great blog hop! Love the way you stamps the flowers... great color combo too! Great stamps and wonderful color combos.. Thanks for the chance to win these beautiful stamps. Two stunning cards. Love the bright colours with the grey. The dimension on the first really pulls the whole thing off. How clever to use the stem to make a frame! Love both of the cards! Creative use of flower and stems! Happy Birthday STAMPlorations!